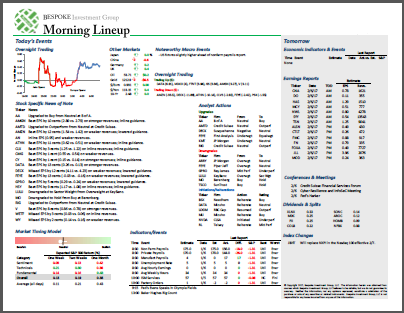 Bespoke Morning Lineup — 10 bps! This morning is about as quiet as it gets in terms of domestic news for equity markets. 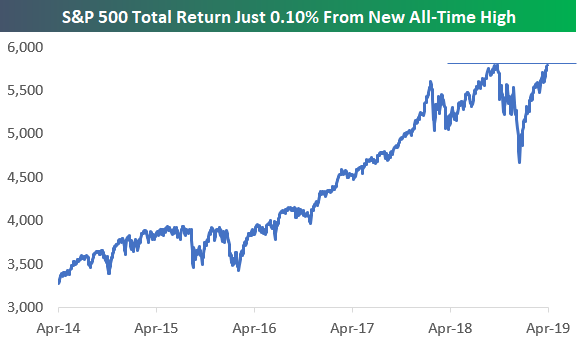 One thing to note — while the cap-weighted S&P 500 remains about 1.2% below its all-time closing high of 2,930.75 (reached on 9/20/18), the S&P 500 Total Return index (which includes dividends) is now just 10 basis points away from a new all-time high. The US equity market has effectively re-gained all of its Q4 losses at this point; now it just needs to clear one final resistance hurdle.